The Klein Karoo – So Much to See and Do! This is big sky country and is the most diverse region in the Western Cape. Oudtshoorn is famous for its friendly people, the mystique of the magnificent landscapes, scenic routes through picturesque towns, world famous sights, lush vineyards and orchards and the dry open veld that stretches into the distance. Adrenaline Sports are plenty in this area! WE’RE SOCIAL! PLEASE JOIN US! Join us on our Facebook where we are chatting about the area and the guest house. Watch out for Facebook only specials! If you love us, please LIKE us! Meet up with our own sociable and chatty celebrity ostrich, KENNY. your next visit to us! Our new on-site spa facility will add some extra pampering to your holiday. Treatments include massages, facials, hand & foot treatments, exfoliation, body wraps and more – with the signature range of Kalahari spa and beauty products. Experience a touch of Africa – in the comfort of our luxury farm style surrounding. Mooiplaas Guest House is a luxurious four-star guest house in Oudtshoorn – situated on our family-run working ostrich farm, in the heart of the Klein Karoo. Here you can enjoy the open spaces of the ostrich farm and the spectacular views of the magnificent and ever-changing purple Swartberg mountains. If you wish to relax, this is the place to get away from it all. If you are looking for sport and adventure, stay with us and enjoy the large variety of attractions and activities in the Klein Karoo area. At Mooiplaas we are proud of our history and heritage. When you stay with us, we extend you our warm country hospitality that has been part of our rich local culture for generations. 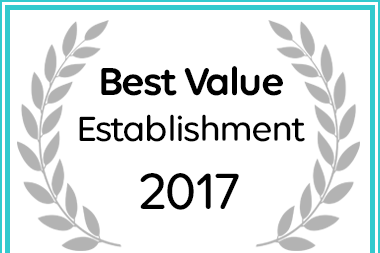 Afristay has named Mooiplaas Guest House in Oudtshoorn a Best Value 2017 Establishment. Thanks for a lovely stay here with the beautiful landscape and friendly people! Came late during dinner time but got the best of welcome! Dinner was fantastic, service extremely good! Room was great and will definitely recommend this place!!! Arrived here in time for a very interesting tour of the ostrich farm. Our 3 young grand children particularly loved holding the tiny chicks! We all loved our ostrich steaks for dinner and the swimming pool was well used. A wonderful return visit which will, no doubt, not be our last! My third stay-over here. It is, as always, a lovely place! I love the heart that is put into all the little details. Thanks again for great hospitality. Coming back again! Want to get away to the beach with the family? We'd also love to welcome you at Dana Bay – our lovely beach house in the Garden Route, only 5 km from Mossel Bay. This fully equipped self-catering holiday house is ideal for families (or even a romantic getaway).